Sheila Bailey is a Registered Dietitian specializing in Wellness through Exercise Prescriptions, Grocery Store Tours, Nutrition Workshops, Seminars conducted at your business. Certified as a Exercise Physiologist through The American College of Sports Medicine, as well as a Certification in Adult Weight Management through The American Dietetic Association. Sheila is a member of The American Dietetic Association, Scan Dietetic Practice Group as well as Nutrition Entrepreneurs and Nutrition in Complementary Care. She is an amateur endurance Athlete competing in marathons, triathlons and encourages all who counsel People about health to put into "practice what they preach". Personalized nutrition and exercise plan based on your individual needs and goals. Monitoring of meal plans by your personal Registerd Dietitian,Sheila Bailey. Recipes provided using your favorite foods. "Ms. Bailey has become a vital part of our team coordinating and leading our grocery store tours, to help educate our customers on the benefits of using food labels to choose healthy foods as well as advising on samples of foods to showcase. 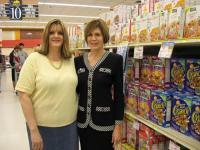 Our store employees receive many compliments on Ms. Bailey and her efforts on spreading nutritional knowledge. Point of purchase nutritional education is an excellent way to help our customers start eating healthy. And the best part of the tour is the customer gets to try before they buy. Oh, I have even lost weight by learning how to read food labels to choose healthy snacks!"